Hello Nosh Show Listeners! No ice cream today, but we are going to try out a new segment for Episode 107. You see, we're each going to try something live instead of doing our usual Nosh or Nots. 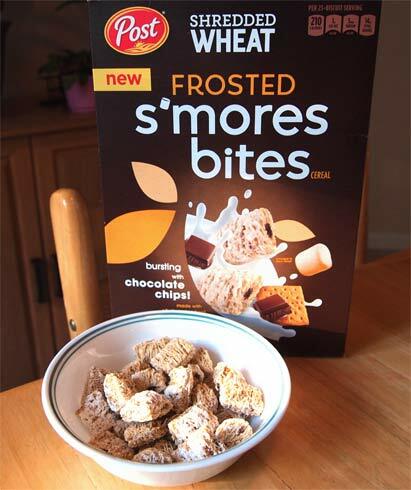 For our first crack at this, I'm going to combine two of my favorite non ice cream things, cereal (in particular mini wheats) and graham (in particular s'mores). Ok, did you listen already? Please let us know what you think of this new segment. We already have one idea for tweaking (speeding up) the whole process, but you feedback is important so that we get the most fun out of it. Thanks! At the end of my live review, I mentioned trying these as a proper breakfast in a bowl with some milk, and now having just done that I have to ask "why does anyone buy the Post version of mini wheats?" They taste slimy or like plastic and I don't know why. 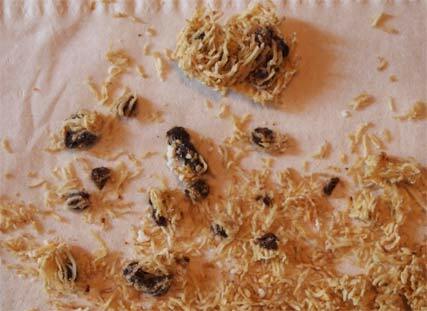 I'm shoving them in for the sake of reviewing, but I will never buy Post shredded wheat again. Kelloggs is far superior. I hate how these feel when drenched in milk. Bleck. Sad Note: If my photos look extra blurry it's because my beloved Olympus Pen E-PL1 camera has just about had it. It's put in over five years of loyal service to this blog but I think I've lost a second auto-adjust sensor on the unit and I can't get a decent picture out of it anymore. I got a great deal when I bought the PL1 because the E-PL3 had recently come out but no similar discount deals are going on right now unfortunately. The most annoying part is that camera reviews don't really seem to be cool anymore, and most stores only put out a couple for you to play with. I know, first world problems, but I can't help I get attached to things. Anyway, that's it for now, have a good week everyone! Sorry to hear about the camera. dpreview.com does very thorough camera reviews, in case you weren't aware of them before. Thanks for the tip, but I must ask, didnt dpreview used to have a lot more reviews? I was there recently and they don't mess with the entry level and bottom half of the mid tier stuff anymore and I thought they use to. Most of the sites I used to check have given up on camera reviews as well. Twenty million sites about phone reviews and no decent camera sites anymore. I don't want twelve pictures of the camera, i want to see twelve pictures the camera took. Sorry, just frustrated. I will try Photographyblog.com and some others I guess. I just have to hunker down and pick something. Yeah, they seem to focus on mid-to-high-end gear, though I think a big part of it is just smartphones hollowing out much of the lower-end market. Good luck with your search!